What are neeps? 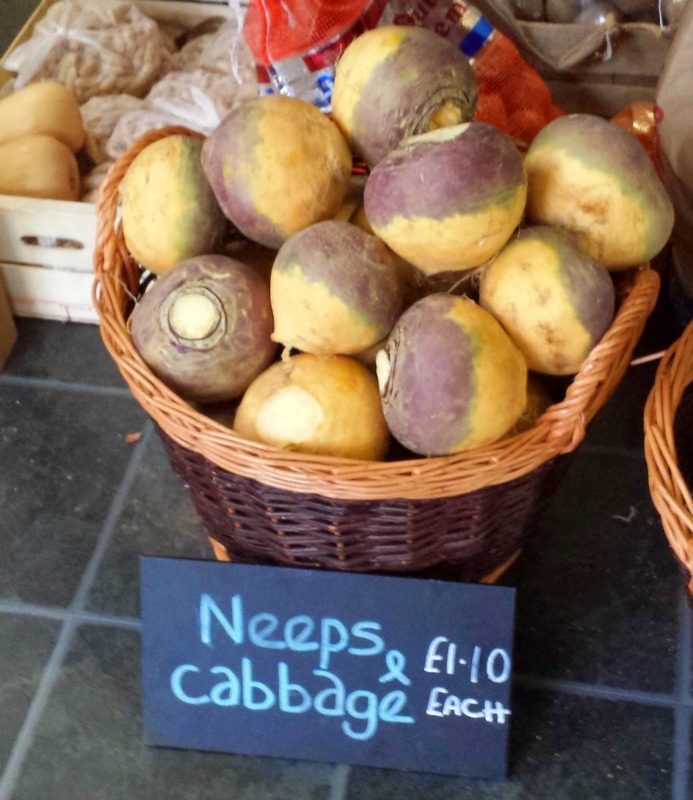 Simple, a neep is a root vegetable and baffling item of Scottish cuisine. Hang on while I try to explain the neep's role in Scottish heritage. I am tempted to call this piece 'Truly, Madly, Neeply'. So, you don't know what a neep is? You're not from around these parts then? The easy answer to this neep uncertainty is that they are globe-shaped root vegetables of a purple hue. About the size of your head. OK, they're a big purple root vegetable. Some use the alternative name rutabaga, but I only found that in a dictionary. Never heard of it before! 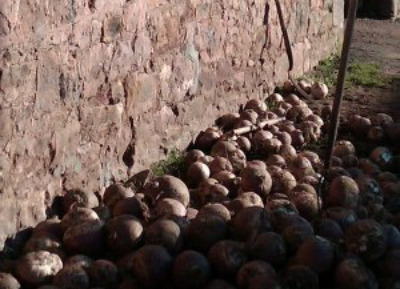 In Scotland, neeps are often fed to sheep when grass is scarce in winter. Sometimes, the sheep will be let into a field of neeps, still in the ground, and simply chomp their way through them. Identical vegetable, different names. what are neeps? Tesco thinks it knows. (Pictured here) See? Same neeps grown by same farmer in Fife, probably in the same field, now sitting side by side but with different labels. And I don't want to read too much in to the fact that it's the British neep - sorry, swede - that has the reassurance that it's 'delicious roasted or mashed' whereas the Scottish neep is just a neep. Anyway, vive la difference, though patriotic fervour would still make me plump for the one on the right. Confused? This isn't helping, is it? But wait, worse is to come. 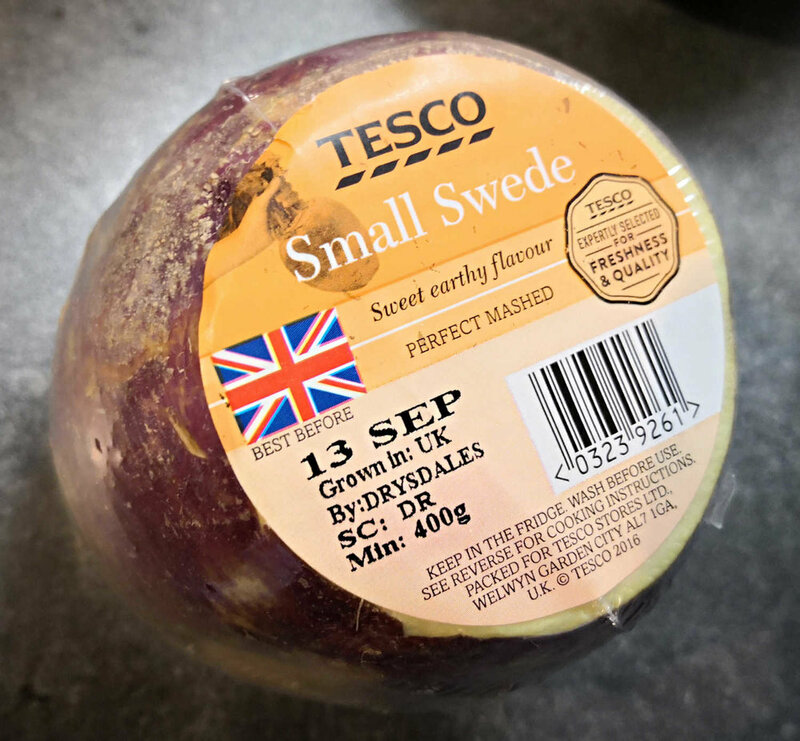 The supermarket Tesco, who sell neeps as well as a few other items, have recently stuck a Union flag on a Scottish neep and have definitively plumped for swede. I mean, apparently, they grow one third of all neeps, sorry, swedes, eaten in the UK. Their logo somewhat romantically proclaims they are ‘growing great vegetables in the fertile lowlands of Scotia’. There was one other ritual, which probably still goes on in rural Scotland. I’ve seen it myself when I lived next to a farm. It had nothing to do with Halloween, to be honest. From despised root vegetables, they were suddenly transformed into objects of desire. I’ve seen respectable folk stop their cars – though leaving the engine running – and help themselves. I suspect this was more to do with soup-making rather than anything more sinister. You could call it kidneepping or just An Encounter in Neep Space. These old-established northern Scottish farms, some of which grow neeps, are often transferred from father to son. This is a real example of widespread neepotism. And it is to avoid paying a lot for a neep in such places that I suppose country folk like to help themselves from the farmyard. Oh yes, I catch myself eyeing up neep-heaps most winters...maybe I have neep-envy? First of all, while neeps are usually silent, they can sometimes make a rhythmic sound - a bit like ‘thunk-thunk-thunk’. This is when they are harvested on a large scale by some kind of tractor-drawn devilish device, which projects them via a tilted conveyor belt into a metal cart drawn in parallel to the first tractor. First time I saw it on a cool autumn day I thought there was a bit of a neep in the air. It was hypnotic, trust me; but then I don’t get out much. Secondly – and not many people know this – you can tell if a field has neeps in it immediately after sowing because the upturned earth, or drill, pronounced dreel in Scots, has a profile like an inverted ‘V’, with an indentation on the peak. However, for those unhappy souls who have actually got so little to do in the office that they’ve read this far, the mention of tatties (potatoes, potatoes – do I have to explain everything?) leads on to the final stage in the life cycle of the common neep. Aside from winter feed for the beasts, you’ll find them on your plate at a Burns Supper. They are the orangey mush next to the haggis and alongside the aforementioned tatties (aka yellow mush). Both neeps and tatties will be chappit, that is, mashed (really ‘chopped’). And I’ve just had the terrible thought that it’s only a matter of time before haggis is served not with chappit neeps but with chappit pumpkin. So, farewell to the neep’s role at Halloween – in any case an unappealing grisly kind of celebration at the beginning of winter, now hijacked by commercial tat. And you don’t even get a drink. But Burns Suppers are something else. Here the humble root vegetable will continue to play its culinary part. Fellow Scots – stand by your neeps! Sorry, forgot to mention: to accompany haggis, simply peel a neep (or part of it), chop small then boil till tender. Salt and white pepper are usual, though remember the haggis will probably be peppery too. Sophisticates amongst you should add a dash of nutmeg. When tender, drain and mash, just like you'd mash potatoes, I mean, chap tatties. That way, you get chappit neeps. In case you still lack confidence in neep-spotting, there's a picture of haggis, neeps and tatties at a Burns Supper on the link here, which also gives you hints on a typical Burns Supper format. Finally, for those of you still with me, a quick note about neeps at Halloween. Now obviously those wee white globes that my father - OK, OK, probably wrongly - called swedes, would be no use at Halloween because, traditionally, neeps were hollowed out to make that de rigeur lantern - a role now taken on by pumpkins. For some years now, this bloated and orange New World usurper - wait, I think I just described a trumpkin - has diminished the role of our own home-grown vegetable at Halloween. There were lots of traditions associated with this time of year in Scotland. Most of them have disappeared but you can find references to them in the poem ‘Halloween’ by Robert Burns.